Red-headed Woodpecker - inside cavity, Deerfield, Franklin Co., MA. May15th, 2010. Saturday (05/15/10) would see us take a family visit up to the Lewis Track and Field training facility in by Eagle Brook School in Deerfield. Two evenings before that I'd heard a Red-headed Woodpecker calling from a small tract of woodland near the track and decided to go back in an attempt to get a sighting, and perhaps even an image. On arrival we didn't hear any woodpeckers calling or drumming but patient waiting along a nearby powerline cut eventually produced one, then two Red-bellied Woodpeckers being hotly pursued by a Red-headed Woodpecker! 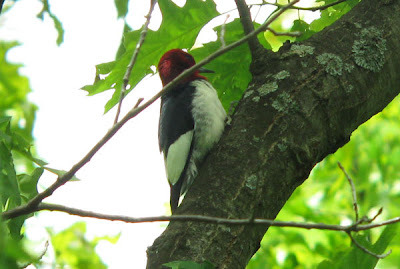 A crazy 'back and forth' then ensued for some minutes to the point where sightings of Red-headed Woodpecker were so frequent that I felt sure two birds must be involved, but at no point did I have two Red-headed Woodpeckers in view at the same time. This close association between the Red-bellied and Red-headed Woodpeckers was intriguing and by following them I was eventually led to a cavity high in a Sugar Maple. 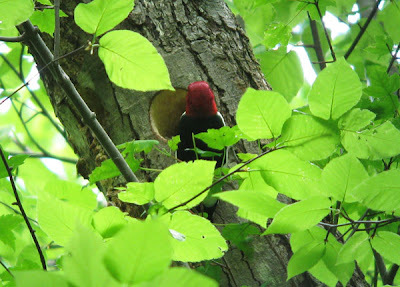 I saw a Red-headed Woodpecker enter the cavity, seemingly suggesting breeding - "brilliant", or so I thought! A minute or so later the Red-headed left the cavity, but the hole was still occupied, this time by a Red-bellied Woodpecker! 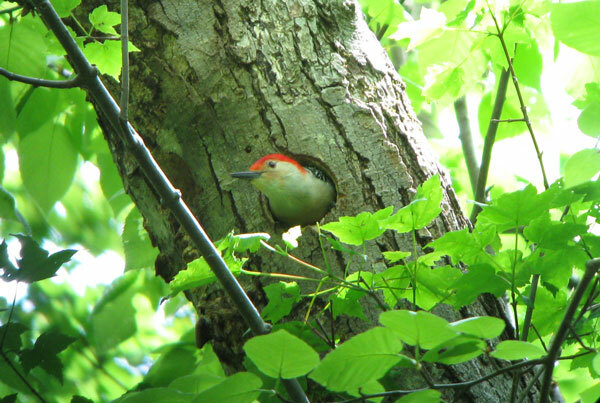 Over the next ten minutes I watched amazed as both Red-headed and Red-bellied Woodpeckers entered and left the same cavity. 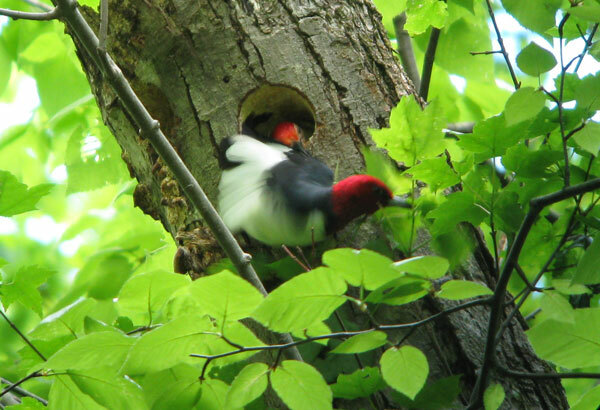 It was the first time I'd seen two different species of woodpecker attempting to occupy the same cavity but, after a little background reading, it would appear that the Red-headed may have been the aggressor. 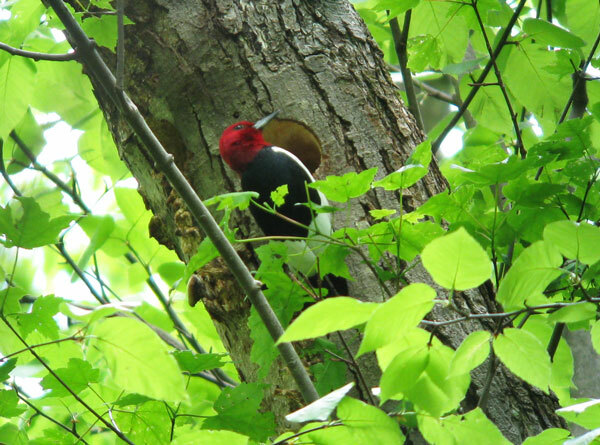 Apparently Red-headed can be aggressive towards Red-bellied (especially) and other species of woodpecker sometimes usurping them from nestholes and will also eat the eggs and nestlings of other bird species! Certainly, the size and positioning of the cavity would, in my experience, be more typical of Red-bellied Woodpecker so my assumption was (though I'm far from sure) that the Red-headed was indeed attempt to usurp this pair of Red-bellied from their cavity - not quite what I was expecting to find on a sunny Saturday morning in Western Massachusetts! 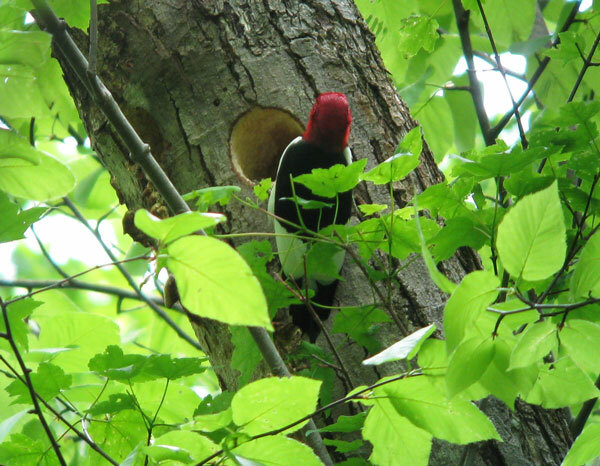 Red-headed Woodpecker - at cavity, Deerfield, Franklin Co., MA. May15th, 2010. Red-bellied Woodpecker - at the same cavity as above, Deerfield, Franklin Co., MA. May15th, 2010. 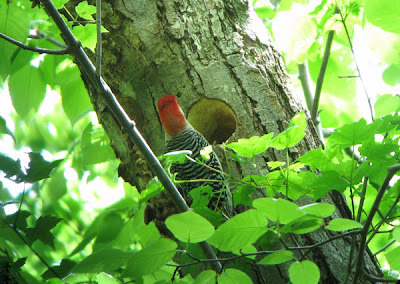 Red-bellied and Red-headed Woodpeckers - at same cavity, Deerfield, Franklin Co., MA. May15th, 2010. In this image, the Red-headed is just leaving the cavity, possibly having been pushed out by the Red-bellied (just in shot inside the cavity). 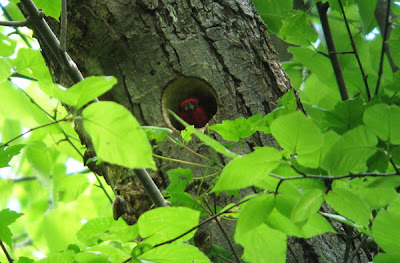 Red-bellied and Red-headed Woodpeckers - at same cavity, Deerfield, Franklin Co., MA. May15th, 2010. 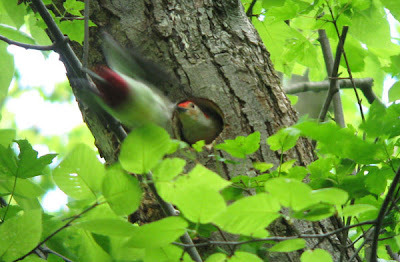 Another image, the Red-headed is just leaving the cavity once again, possibly having been repelled by the Red-bellied visible inside the cavity. Red-headed Woodpecker - Deerfield, Franklin Co., MA. May15th, 2010. Bird in more relaxed mode, these shots taken from the powerline cut. 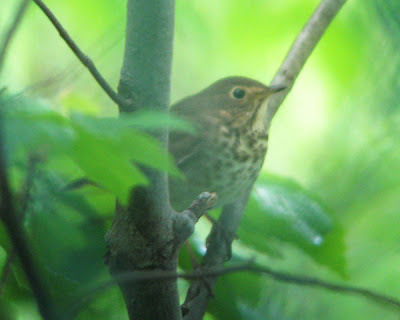 Swainson's Thrush - Amherst, Hampshire Co., MA. May 12th, 2010. 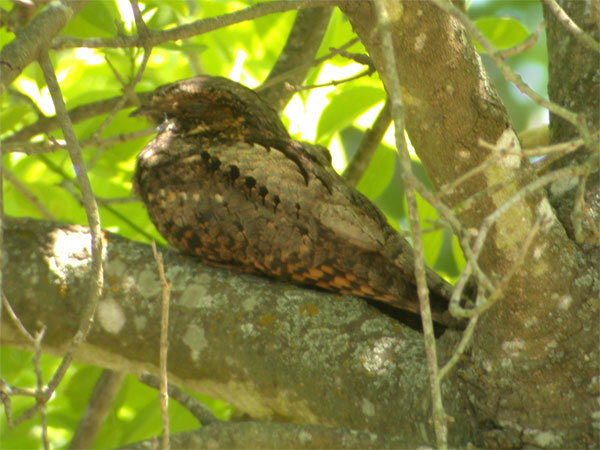 Shy and usually quite difficult to see on migration. I had to be content with these poor record shots taken through a chain link fence on the Amherst bike path. The excellent run of local Swainson's Thrushes continues. Rain all day today and pretty cold, (below 50 deg F). Rather quiet in terms of birdsong as a result, except for American Redstarts with about seven seen and heard along the Amherst bike path. 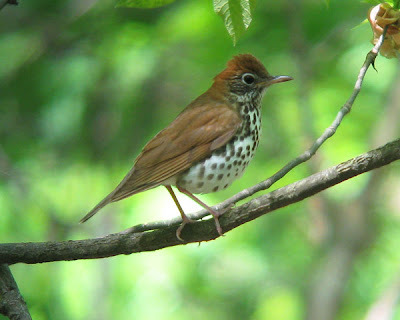 But, the low 'pwip' call of Swainson's Thrush was audible at several spots along the bike path today with two birds seen well - probably about five present in total. 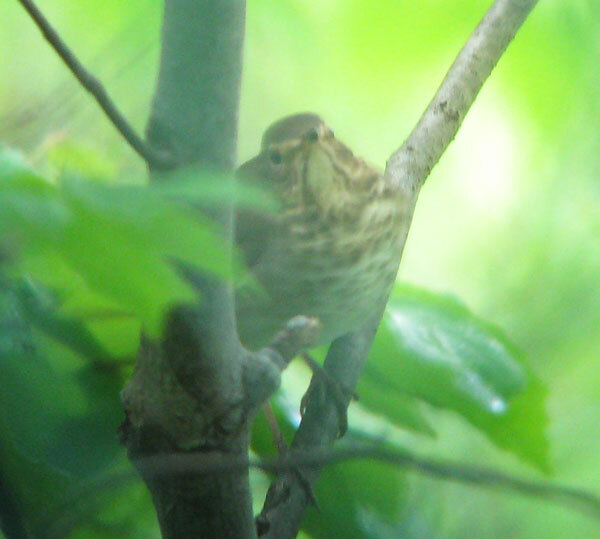 Another Swainson's Thrush was singing on Redgate Lane, Amherst this evening. My evening run produced my first local Eastern Wood-Pewee of the year singing loud and clear in the Wildwood Conservation area where there was also a Great Crested Flycatcher. At Orchard Hill, UMass campus, at least two singing Blue-winged Warblers. Northern Parula - singing male, North Whitney Street, Amherst, Hampshire Co., MA. May 11th, 2010. Magnolia Warbler - singing male, North Whitney Street, Amherst, Hampshire Co., MA. May 11th, 2010. Very cold to start with this morning, frost much evidence in the early hours. However, the local streets and woods were, once again, full of bird song. During my morning run I tallied at least a dozen Northern Parulas singing, none of which will stay in our area to breed. 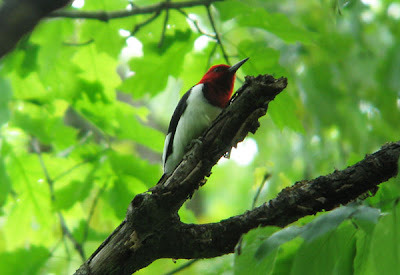 Also numerous Scarlet Tanagers, Baltimore Orioles, Blue-winged, Black-throated Blue and Blackburnian Warblers. 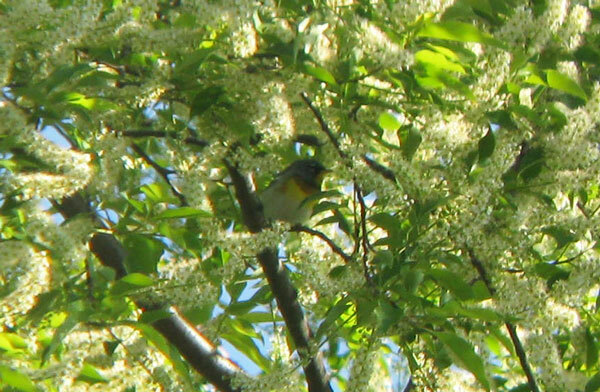 At home, a single Black Cherry tree held Northern Parula, Magnolia, Blackburnian, and Yellow-rumped Warblers so I took the opportunity to take a few digibin shots from the bedroom window! Off the rear deck, a Swainson's Thrush was grubbing around in the leaf litter. Later in the day, a Common Yellowthroat was a surprise in the flower beds outside Holdsworth Hall on the UMass-Amherst Campus. 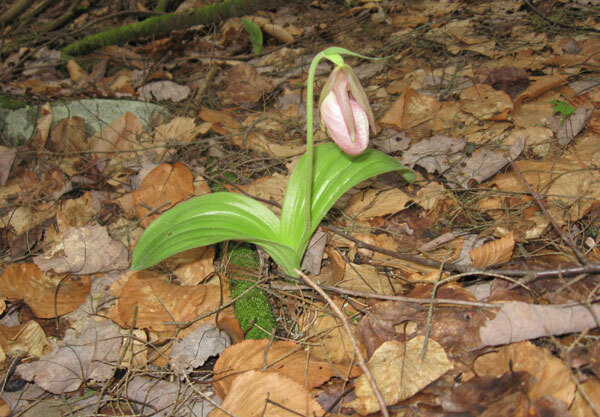 Pink Lady's Slipper. Shutesbury, Hampshire Co., MA. May 9th, 2010. 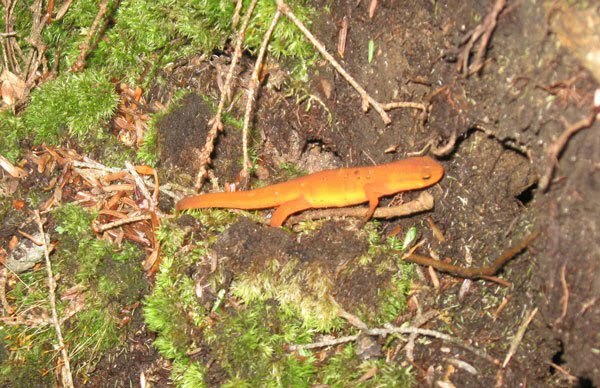 Red-spotted Newt (red eft/terrestrial juvenile). Shutesbury, Hampshire Co., MA. May 9th, 2010. 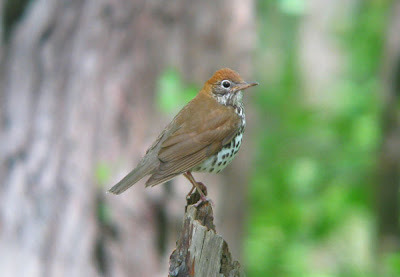 Hermit Thrush. Shutesbury, Hampshire Co., MA. May 9th, 2010. Swainson's Thrush. Shutesbury, Hampshire Co., MA. May 9th, 2010. Raw and unseasonably cold, but at least the mosquitoes were kept at bay. We took a casual Mother's Day stroll along a small section of the Robert Frost Trail in Shutesbury. 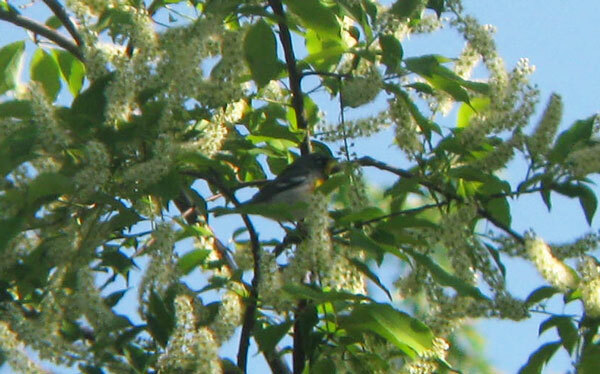 Birds were relatively few but Blackburnian Warblers (5+) amongst the most frequent singers, with Black-throated Green and Black-throated Blue Warblers as well, along with several Ovenbirds. 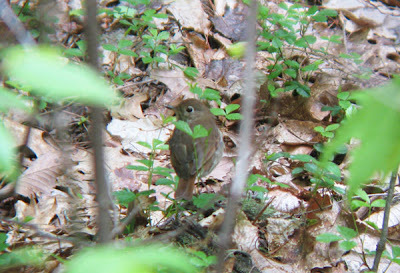 A migrant Swainson's Thrush lifted up from the leaf litter by the trail with two Hermit Thrushes further along the same trail for a nice comparison. 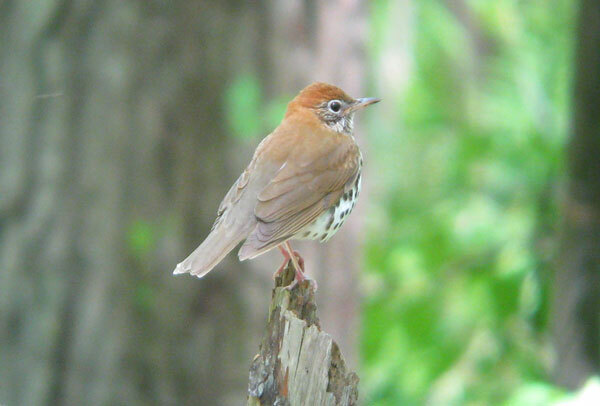 Wood Thrush - Amherst, Hampshire Co., MA. May 7th, 2010. It's amazing how approachable some birds will be if one just stands quietly in the woods. 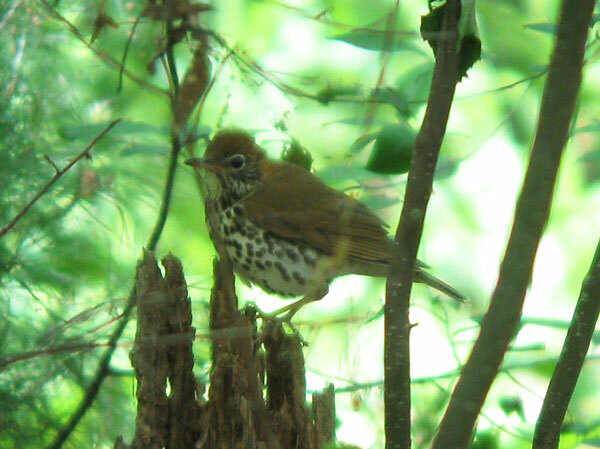 Wood Thrushes only arrived a few days ago (May 2nd/3rd) but already seem to be widespread and common. This bird was foraging just a few yards off the bike path in Amherst. 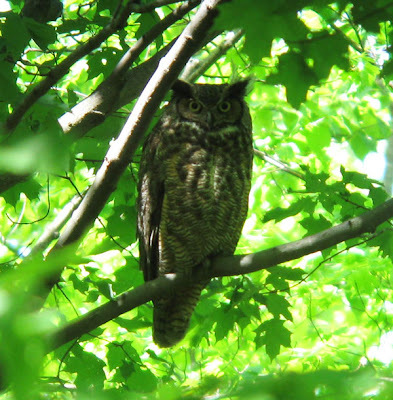 Also along the bike path on the 7th, Black-throated Blue and Chestnut-sided Warblers and a singing Indigo Bunting, plus good views of a Great Horned Owl. Another busy day locally with at least 7 Northern Parulas singing along North Whitney Street/Redgate Lane, two rather nice Magnolia Warblers, 3 Black-throated Greens and at least 30 Yellow-rumped Warblers. Great Horned Owl - Amherst, Hampshire Co., MA. May 7th, 2010. Chuck-wills-widow - Williams' residence, Pharr, TX. April, 2005. It's looking like my May 4th observation of a daytime Chuck-wills-widow in New Salem may be a less freakish sighting than I first thought. 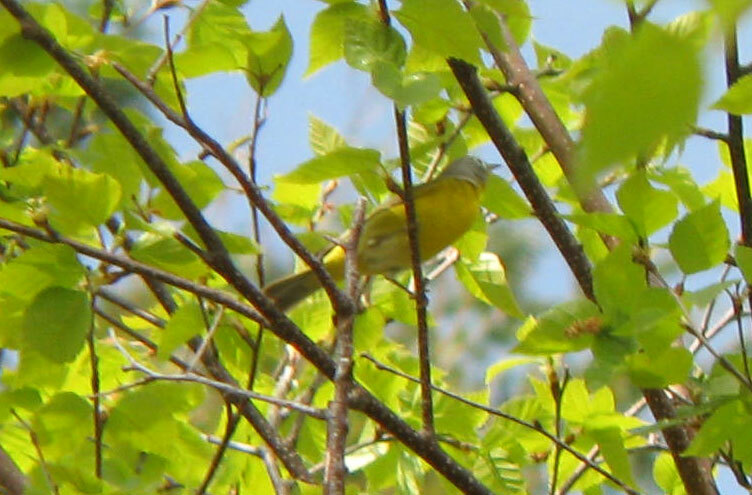 The very same day, John Galluzo reported a bird that gave a brief, but loud burst of song in the middle of the day at Daniel Webster Wildlife Sanctuary in Marshfield, and a day later Kristen Lindquist received a report of a pre-dawn singing bird from Camden, Maine on May 5th. 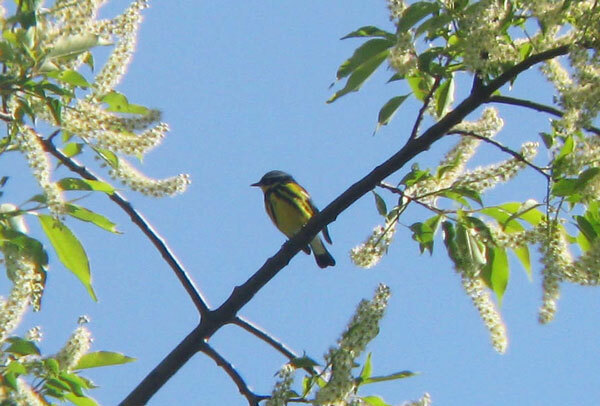 The most recent concerns of report from Peter Trull of another singing bird in East Orleans on May 7th. Interestingly all of these records are earlier than any report given in the Birds of Massachusetts (Veit and and Petersen), where the species is described as "Rare but regular visitor, primarily in spring", with spring records beginning from May 9th. 05/03 - A Wood Thrush sang in our yard at first light after fairly heavy overnight rain. Gray Catbird and Nashville Warbler could be heard too. Bobolinks were fresh back in the hay fields off Strong Street and an Indigo Bunting sang its strident song from trees in Groff Park, Amherst. About three Northern Parulas singing along North Whitney Street. 05/04 - Visited a site in New Salem inside the Quabbin restricted area. What a difference a week makes! I was greeted by a wall of sound with several more local year firsts : Solitary Sandpiper, Great Crested Flycatcher, Chestnut-sided Warbler, Least Flycatcher (6+), Field Sparrow and Purple Finch. 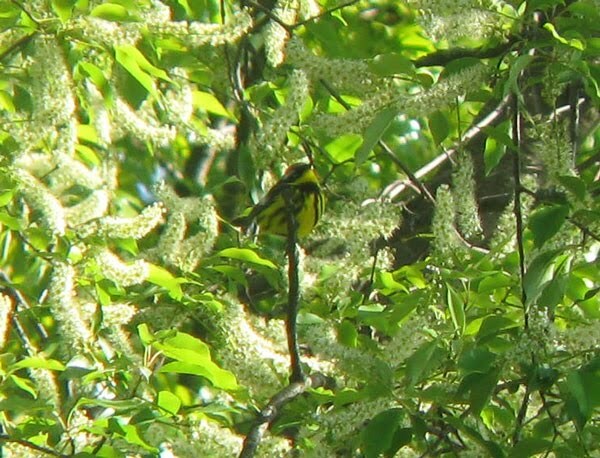 In addition species such as Wood Thrush, Yellow-bellied Sapsucker, Eastern Kingbird, Black-throated Blue, Black-throated Green, Blue-winged and Prairie Warblers appeared to have arrived in numbers. Most intriguing sight of the day was a Chuck-wills-widow that flew across the track in front of my car!! It took a little while to register but I'm certain that's what it was. I had a brief search for it where I thought it landed but came up empty and it must have continued and landed in much denser cover away from the track. 05/05 - No birding as such today but there was at least one Bobolink displaying high over Groff Park, and a Great Crested Flycatcher calling in the Wildwood Conservation area, both in Amherst. 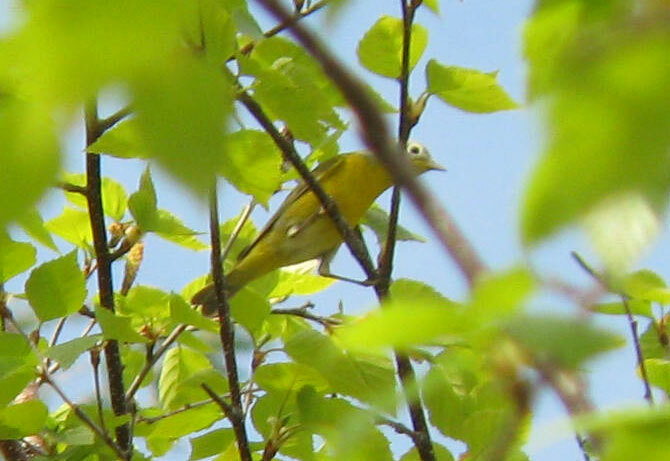 Yet another yard first, and a complete surprise - a female Orchard Oriole which appeared in the trees off the rear balcony in mid-afternoon. Wow, what a month is May! MA - 05/02 - lots going on! 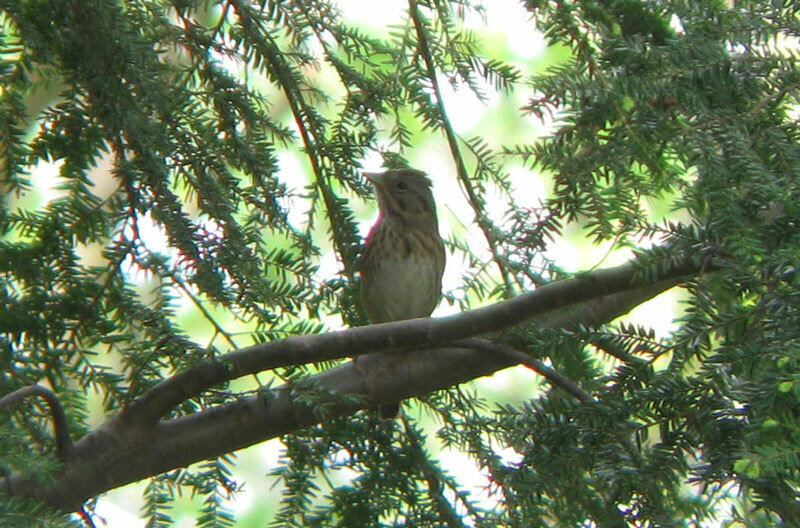 Lincoln's Sparrow - Amherst, Hampshire Co., MA. May 2nd, 2010. Well, the floodgates really have opened! Most of the expected migrant breeders have shown up locally, and even one or two that might not have been expected. Sunday May 2nd was a scorching day with temperatures close to the 90s with relatively high humidity. During the course of a six mile run from home I heard/saw lots of local firsts - Ovenbird and Black-throated Green Warbler on Redgate Lane, Blue-winged Warbler and Eastern Kingbird on North-east Street, Prairie Warbler and 2 Northern Waterthrushes near Cushman Market, North Amherst. 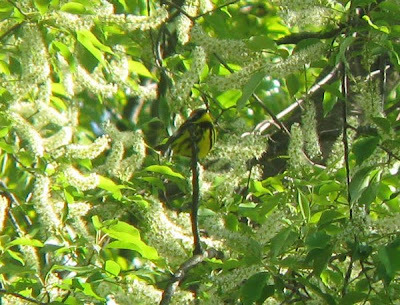 Despite the heat of the day, a walk on the Amherst bike path was equally productive with many Baltimore Orioles, Scarlet Tanagers and Rose-breasted Grosbeaks, though few warblers with only Nashville and Black-throated Green amongst the more numerous Yellow-rumped Warblers. 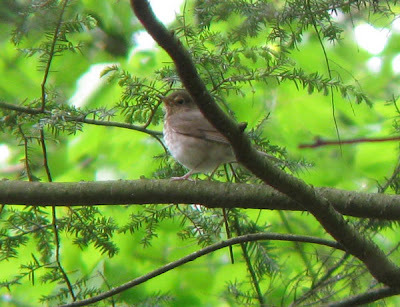 Slightly more surprising was Lincoln's Sparrow with a handful of migrant White-throateds, and back home on North Whitney Street, Amherst a female Eastern Towhee was an unexpected yard first. Nashville Warbler - High Ledges MAS, Franklin Co., MA. May 1st, 2010. This morning we took a very enjoyable family hike around High Ledges Massachusetts Audubon Sanctuary over looking Shelburne Falls. As we stepped out of the door of our apartment in Amherst, the songs of Northern Parula, Grey Catbird and Yellow-rumped Warblers greeted us and several Chimney Swifts cruised overhead. The warm air and the volume of bird song had further increased from yesterday. The drive included singing Louisiana Waterthrush and Yellow Warbler just north of the Mohawk Trail and at High Ledges MAS many woodland songsters could be heard and seen with Ovenbird and Yellow-bellied Sapsucker at the parking area, followed by many Black-throated Green and a few Black-throated Blue Warblers around the sanctuary. Indeed, Ovenbirds and sapsuckers could be heard throughout our 2.5 mile loop. 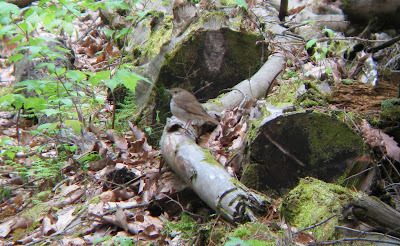 We also heard and saw a Nashville Warbler along with several Black-and-white Warblers and there was a single Winter Wren near the parking area. A handful of Broad-winged Hawks appeared to be migrating, as did an Osprey, all seen from the ledges. Around stands of Eastern Hemlocks Hermit Thrushes seemed to be everywhere and we must have tallied 18 during the walk, along with a single Swainson's Thrush. The afternoon was positively balmy which, combined with a nice southern breeze, will doubtless ensure more migrant arrivals over the next few days. For the birds already here, they don't seem to be wasting any time at all - we saw a Blue-headed Vireo nest building at High Ledges today! 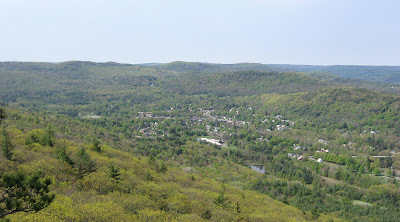 Shelburne Falls seen from High Ledges, MAS.